Cillian Gallagher will start in the second row for the western province in one of 10 changes to the team that beat Bordeaux. ANDY FRIEND HAS handed a first start to 21-year-old Sligo man Cillian Gallagher in the second row for Saturday’s trip to conference rivals Cardiff. Academy product Gallagher’s introduction is one of 10 changes to the team that beat Bordeaux to seal a spot in the Challenge Cup quarter-finals, with six players away on international duty and Gavin Thornbury having been ruled out with a shoulder injury picked up in training during the week. David Horwitz retains his place at out-half but will be joined by James Mitchell at 9, who comes in for last week’s debutant Stephen Kerins. Jarrad Butler returns to captain the side at number eight and will be flanked by Eoin McKeon and Colby Fainga’a. A first-choice back three sees Cian Kelleher retake his place on the wing, while Munster loanee Stephen Fitzgerald will provide the cover on the bench for Kelleher, Matt Healy and Tiernan O’Halloran. Connacht currently sit five points clear of the Blues in Conference A of the Pro14, and head coach Andy Friend is under no illusions as to the key nature of Saturday’s fixture. “We have won eight of our last 10 games so we go into the game with confidence”, said Friend, “but we know what a tough team Cardiff are to play, especially when they are at home. These inter-conference games have a huge bearing on the overall standings in the PRO14 so we are fully aware of the importance of the fixture. Email “Youngster Gallagher gets first start as Connacht make 10 changes for key trip to Cardiff”. 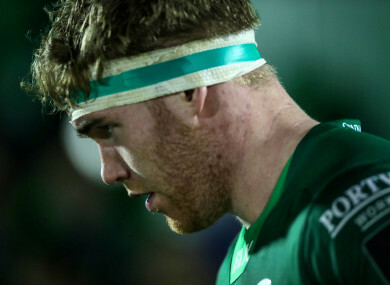 Feedback on “Youngster Gallagher gets first start as Connacht make 10 changes for key trip to Cardiff”.